Posted September 13, 2017 by Alec Smart & filed under City Hub, City News. 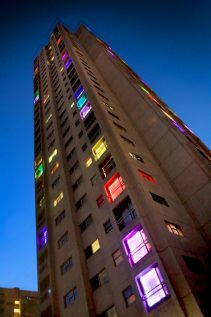 The twin towers at the centre of Waterloo public housing estate have been illuminated with squares of coloured lighting for an arts project that draws attention to their uncertain future. Visible from a distance, the 30-storey high Matavai and Turanga building windows light up at 5.30pm each evening with a display that resembles a watercolor artist’s paint palette. The organisers behind the illuminated windows, We Live Here 2017, conceived of the art installation prior to the December 2015 announcement that the entire 18-hectare Waterloo public housing estate will be demolished or sold to private investors. Clare Lewis, project supervisor, lives near the condemned buildings and originally considered lighting up the towers as a public art installation. Upon learning they were facing demolition she changed the focus. “And then when the redevelopment announcement came we thought maybe this could have a more political or community activism kind of bent – so we redeveloped our project after the redevelopment announcement! The windows transition through a rainbow of purple, blue, aqua, green, yellow and red, whilst others glow or strobe a single colour. The take-up throughout the towers was enthusiastic, with many residents considering continuing after the program ends on 1 October. Catherine Wood, resident of Matavai building, said she was thrilled when the light show began. Vincent Mackey lives on the top floor of the Matavai Building in what he jokingly describes as the ‘penthouse suite’, the level Queen Elizabeth visited when she opened the tower on 14 March 1977. “I think they’re great!” he said. “We can have them for as long as we like. I’ll probably keep mine going after the project has ended. “They only cost about $2 a month to run. The colours fade, flash or change – I like that one. Xmas will be a good time to switch them back on and during the annual Vivid Festival of lights. It will be like our own Vivid Festival on a small scale but it looks good outside and brings people here. The towers, between Philip and Raglan Streets, have been earmarked for likely demolition in a controversial development project. Four additional high-rise public housing blocks on the Waterloo estate, Joseph Banks, James Cook, Marton and Solander, will be razed to make way for up to 10,000 homes and an underground railway station on the new Sydney Metro. The Metro line, between Cudgegong Road (near Rouse Hill), north of Sydney, and Bankstown in the west, via Macquarie Park, Chatswood, the CBD and Sydenham, is expected to open in 2023 at a cost of around $10 billion. A Metro station was originally planned for Sydney University, however, in December 2016, then-Premier Mike Baird cast a deciding vote that diverted it through Waterloo instead in order to trigger a massive development project of new apartments. Ultimately they will be 70% owned by the private sector, the remainder geared towards public housing. To enable construction work, up to 4000 existing public housing tenants will be evicted, starting mid next year. In December 2015, then Social Housing Minister Brad Hazzard gave assurances that those tenants facing eviction will be given the right to return. “I can assure Waterloo tenants that if they want to remain in Waterloo after the redevelopment, they can do so,” Hazzard said. “Your interests will be absolutely safeguarded. There won’t be any less social housing.. However, years might elapse before those evicted can return because the project will take 15-20 years. Catherine Wood praises the illuminations for prompting discussion on the towers’ future. “It’s very successful in drawing attention to what could be the destruction of Waterloo, what they call ‘redevelopment’. These are heritage buildings and they should be preserved. People don’t usually think of this type of architecture as heritage, it’s not quaint with wrought iron balconies. But Sydney Brutalist will never be built again because people don’t have the skills. Many other examples have been pulled down. Richard Weeks, chair of the Waterloo Public Housing Action Group, rejects the need to demolish the towers. At a public meeting in August 2017 he said, “Sydney Metro is being built to increase the value of private housing. “The NSW Government doesn’t like the word ‘demolish’,” said Clare Lewis. “Basically, they don’t know what they’re going to be doing with this estate. It may well be that a Hong Kong investor comes in and buys all these towers and sells the flats off for one or two million each, but we don’t know yet what the master plan will be. • #WeLiveHere2017, part of Art & About Sydney, turns on nightly at 5.30pm at Matavai and Turanga Towers on Waterloo Green, Waterloo.